For a reason unbeknownst to me, I have only recently discovered a fantastic blog called Creature Comforts. Google Reader knew I would love it! Boy, have I been missing out! Ez writes about a plethora of things, all of which are beautiful and so very inspiring. 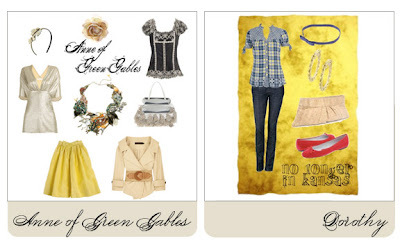 The images she features and the very layout of the blog are simply gorgeous. 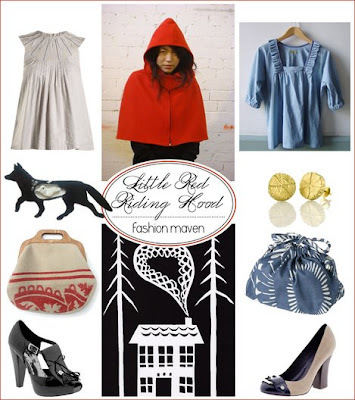 Recently, Ez did a post featuring what she thought a modern day Little Red Riding Hood would wear if she were all grown up. 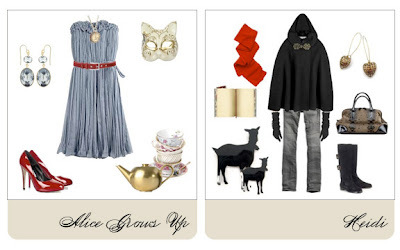 Her readers decided to play along and created looks for several storybook characters. The concept brought a huge smile to my face and took me right back to childhood. It was so nice to read about something inspiring and to take my mind off of the everyday stresses. Maybe I'll try to channel a storybook character the next time I go out. Who should I be? Cinderella? Alice in Wonderland? Snow White? I just wanted to thank you so much for your sweet post about my blog and recent storybook challenge. You really brought a smile to my face and I'm so glad you stopped by for a visit! Thanks again! Hi there! Just wanted to drop you a line and say that I love your blog. I stumbled it via Courtney's blog. I live up a ways in Oklahoma but so wish I was in suburbia with you ladies! Carrie, you are so sweet! I'm glad you enjoy my blog and hope you will visit regularly! Love Ez's blog -- one of my daily reads. 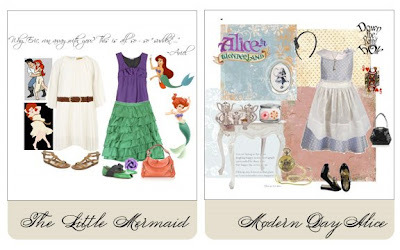 Crazy about this storybook series -- such a creative and fun idea.